Malice, mayhem, mischief and murder in motion have been cinema staples since the first days of narrative film. Mac Sennett’s frenetic Keystone Cops chases, the peril and rescue dramas of Edwin S. Porter (The Great Train Robbery, 1903), the nail-gnawing climaxes of D. W. Griffith’s Way Down East (1920; with the unconscious heroine hurtling toward a waterfall on an ice floe) or Intolerance (1916; crosscutting among four races to the rescue) illustrate how early the moving picture appreciated the ability of motion to elevate dramatic tension and suspense. The “motion” in the motion picture can be the use of a vehicle as the setting for the action or the manipulation of film itself through crosscutting or acceleration of film speed. One of the earliest directors to grasp the dramatic possibilities of movement in the moving picture was Alfred Hitchcock. In an early film, Number Seventeen (1932), Hitchcock was said to be irked with I.J. Farjean’s hackneyed screenplay and demonstrated a wry revenge as he sets up the plot—a jewel heist—by piling on every possible suspense cliché, then throwing the film into warp speed with a fast—paced, virtually dialogue-free second act chase that pits a hijacked bus against a runaway train, and concludes with the train plowing into a departing ferry. One of Hitchcock’s more famous thrillers was co-written with a contentious Raymond Chandler—Strangers on a Train (1951). The plot is set in motion on a moving train: two strangers meet; each has someone in his life he would like to eliminate, one a wife, the other a father. They plot to carry out murders for each other, thus leaving no obvious motive and allowing each man to provide an alibi. Hitchcock sets all of the critical action on a moving stage: the set-up is on a train, the pivotal murder is in a Tunnel of Love canoe, the climax is on an out-of-control carousel. This formula—converting an innocuous vehicle into a sinister one—is used many times by Hitchcock: the lethal crop duster in North By Northwest (1959), the careening family sedan in Family Plot (1976), the potato truck that disgorges a corpse in Frenzy (1972). Hitchcock also used a confined and perpetually moving stage to enclose and intensify the dramatic situation, as in The Lady Vanishes (1938) (not to be confused with Lady on a Train), which involves the disappearance of an elderly railway passenger, and in Lifeboat (1944), a drama of treachery and survival on a WWII lifeboat. Lifeboat is one of the best of the “suspense at sea” films. Though an obvious setting for drama, it is rarely the backdrop for mystery/suspense, outside of the military thriller (The Hunt for Red October, et al.) Two of the better ones are Dead Calm (1989) and The Last of Sheila (1973). In the former, a bereaved couple on a private sea voyage picks up what appears to be a shipwreck survivor and find themselves at the mercy of a psychotic killer. The latter, co-written by Psycho star Anthony Perkins and composer Stephen Sondheim, is also set on a private cruise; a director assembles a group of film folk and reveals that they’ve been summoned to play out a real-life whodunit in order to discover which of the passengers was his wife’s killer. Mayhem in motion wrought by lovers on the lam is often based on fact. Bonnie and Clyde (1967) is a stylized and highly romanticized dramatization of the criminal career of Bonnie Parker and Clyde Barrow. Director Terence Malik’s debut film, Badlands (1974), was an eerie interpretation of the Charles Starkweather/ Caril Fugate crime spree of the fifties. Following the television feature, Duel, which pitted a lone driver against a murderous Mack truck, director Steven Spielberg took on his first theatrical feature, Sugarland Express (1974). Based on actual events, the film’s lovers are a desperate mother and the husband she springs from jail; the two hijack a police car and set out to reclaim their son from foster care. As with Bonnie and Clyde, Sugarland Express poses the suspense of the manhunt against the humorous and violent getaway of the hunted. Another offering from 1974 — quite a year for films in this category—was Robert Altman’s Thieves Like Us, which was a remake of Nicholas Ray’s debut film, the far superior They Live By Night. When the action is confined to a moving vehicle, there are specific challenges to the storyteller: how to exploit a relatively limited area without exhausting its possibilities too soon, thus diminishing the tension. This challenge often compromises the success of “peril on the plane” dramas. An airplane interior simply does not present the mazelike structure necessary to keep the plot rolling, and such films often resort—as did the hijack drama, Passenger 57 (1992)—to moving the plight away from the flight. Air Force One (1997) was able to make this situation work because the commodious and complex setting allowed the film to transfer the Die Hard formula into the President’s plane. On the other hand, “terror train” dramas offer a more accommodating setting for mystery. In Lady on a Train (1946)—based upon a story by Leslie Charteris—a woman passenger cannot convince her fellow travelers that she witnessed a murder on a passing train. In Runaway Train (1985)—based on a screenplay by Akira Kurosawa—escaped convicts jump a train only to find themselves the hijacked, rather than the hijackers when the train careens out of control in a remote region of Canada. The Narrow Margin—the 1952 version, not the less suspenseful 1990 remake, Narrow Margin—is a truly scary cop-and-protected witness-under-siege-on-a-train saga. But one of the best of this category is an underrated 1974 film, The Taking of Pelham One, Two, Three. Directed by Joseph Sargent, best known for The Marcus-Nelson Murders, a pilot for the TV cop show Kojak, this is an intense and intelligent heist/hijacked subway drama that cuts from the negotiations of the cops above ground with the thieves fleeing with their hostages on a subway below. Great closing shot, too, as anyone who has seen the film will agree. But, because of its unrelenting movement, few films can equal the 1994 film Speed for mayhem in motion. The deceptively routine set-up—a foiled bomber rigs a bomb on a city bus to engage when the bus reaches 50 MPH and detonate when the speed drops below fifty. The acceleration never drops; the film is in such a state of perpetual motion that it becomes a homage to the very concept which sets the motion picture apart from its embryo,, photography. Movies move. In Speed everything is set in motion, a collapsing elevator, a car, a bus, a subway train; a bomb’s aftershock sends a body flying through the air, a wheeled platform is released from a moving vehicle and guided underneath the moving bus; the rescue is effected by transferring passengers from one vehicle to another while both are in motion. The summary “What a ride!” was never more aptly applied to a film. Lastly, and for laughs, I would be remiss if I did not mention what has to be the funniest “murder” ever committed on film. In Jim Jarmusch’s 1991 anthology film, Night on Earth, five cabbies in five different cities pick up an odd quintet of passengers. In the Rome episode, the Italian comic Roberto Benigni is the ebullient cabbie who picks up a priest and decides to use the opportunity to make his confession regarding certain sexual exploits involving a pumpkin patch, his sister-in-law and a sheep named Lola. While Benigni rattles off the particulars of his carnal escapades, the hapless priest convulses and expires from shock. Lethally funny. You may die laughing. © Jane Rubino, 1997. Jane Rubino is the author of Death of a DJ (Write Way, 1995) and Fruitcake (Write Way, 1997). “I’ve never been on a train, what’s it like?” I stared incredulously at the woman who had asked me this upon learning that I had travelled to the mystery convention by Amtrak. Never been on a train? How could this be possible? Then I realised that I was in the heart of Middle America, the “flyover zone.” People here drove their cars or flew to their destinations. To many of them, the great gleaming Transcontinental trains were as strange and alien as dinosaurs, survivors of an almost prehistoric age, racing across the landscape to disappear into the distance. Behind their lighted windows they carried their own private worlds, where any number of dramas might be going on—and often are. “I’m sorry the train was so late,” I apologised to the friend who had met me at the station. “It’s because of the boa constrictor that got on at Minneapolis.” (I hadn’t seen it myself—or I’d have beaten the train to Spokane. I heard about it in the dining car — the nerve center for all the gossip aboard.) it seems the snake’s owner had carried it on board in a plastic sack, went up to the observation car to enjoy the view and settled his pet in the seat beside him. As two conductors walked past, one did a double-take and said to his colleague, “Look what this one’s got, man!” How do you throw a man with a pet boa constrictor off a train? That’s right: very carefully. I haven’t used American trains for a setting yet, but in Fatal Fortune, I took full advantage of the vast European network of trains and ferries, whose beautifully dovetailed schedules allow a passenger to board a train at Luxembourg in the early evening and arrive at Ostende in time to connect with the 2 a.m. ferry to Dover. I had done the journey myself (don’t ask!) and it turned out to be excellent background material when I put my heroine through all the drama and trauma of it as she fled from the villains with her non-English speaking young nephew. Since I don’t fly if I can avoid it—and I can usually manage to avoid it—my Atlantic crossings are by ship, a leisurely way to travel and one which means I arrive untroubled by jet lag. It also means I collect far more material than I could ever use. “Getting There Is Half the Fun…” used to be the slogan of a great shipping line. They could also say, “and More Than Half of the Adventure…”; circumstances only hinted at it the fine print on the tickets under the subheading, “Acts of God,” for which the shipping line cannot be held responsible. At other times, they can handle it more discreetly and you round a corner suddenly and discover several crew members in a worried cluster, who try to look unconcerned when they notice you have seen them. Later, you spot them looking into the potted plants, twitching draperies aside to see what’s behind them and climbing up to peer into lifeboats. You know then, too. Sometimes it’s obvious before you even board the ship. When, after having sent your handbag and any parcels through the X-ray machine, and walked under the metal detector arch, you find yourself getting a pat-down body search before you’re allowed to set foot on the gangplank, it’s pretty clear indication that the ship has received a serious threat… again. Death, if not murder, is part of shipboard life. Not with the dramatic cry of “Man overboard!” but heralded by a coded announcement over the public address system. Regular passengers know the code word that signals “Rush resuscitation equipment to” followed by the cabin number. Later, this may be followed by an appeal for the appropriate clergyman to report to the Purser’s Office. Sadly, by the very nature of things quite a few passengers tend to be elderly and not always in the best of health. Two of them died on one of my recent voyages. Not only the elderly die. There was the tragic story of the five-year-old only son of wealthy parents who thought he was being carefully supervised, but it’s very hard to keep watch over a lively child every single moment. The main stairway of the ship is open from the top deck to the bottom passenger deck, one can lean over and look straight down for what would be eight or nine stories ashore. The little boy slipped away from his Nanny and decided it would be great fun to slide down the banisters. The ship lurched… I’m glad I wasn’t on that voyage. So far, I have set two books on board ships: Murder Sails At Midnight and The Cruise of a Deathtime. Although I’ve never used actual incidents, you can see that ocean travel provides a wealth of background, enough for dozens of books. A friend of mine (I think she was a friend) once told me, “I love to listen to your travel stories—but I never want to travel with you.” I don’t blame her. There are times when I don’t want to travel with me, either, but what choice do I have? On the other hand, look at all the material I collect. 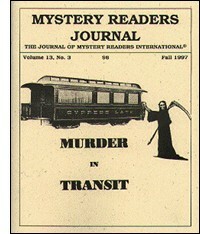 I suppose the classic example of murder in transit is Murder on the Orient Express. In that mystery Agatha Christie had her characters travel through exotic regions and still manage to have her suspects all conveniently trapped until the murder is solved. Modern authors can vary the theme by having the murder occur on a cruise ship or the Concorde, any place that can’t be reached quickly by the outside world and allows little chance for escape. When I started my medieval pilgrimage mystery Strong as Death, I was tempted to have all my characters be forced to spend the winter in the Pyrenees, snowbound in a hostel until the murderer was uncovered. There were two problems with this. The first is that Christie already did it; the second is that twelfth-century travelers were a very hardy lot and didn’t tend to hang about waiting for spring. They just bundled up and set off. Therefore writing a mystery set on a long pilgrimage presented its own set of obstacles for the writer, as well as for the pilgrims. Although until fairly recently most people were born, lived and died in the same area, there were always those who either wanted to or had to travel. In the Middle Ages there were a number of people who traveled widely. Vikings made a living from their journeys, as well as merchants. Entertainers wandered from place to place, seeking employment. Upper-class brides were carted off to foreign lands, bringing with them their maids, priests and other retainers. Eleanor of Aquitaine not only went on the second Crusade while in her twenties, she also traveled from Normandy to Spain, crossing the Pyrenees in winter, to fetch one of her granddaughters to be the bride of Louis VIII. Eleanor was seventy-eight at the time. Just looking at the lives of the twelfth century peripatetic clerics, I was amazed to realize how many times some of them crossed the Alps, often in winter. If they had business, either of the purse or of the soul, they packed their bags and set out. Finding out how twelfth-century pilgrims traveled was much the easiest research I’ve had to do in a long time. This was the beginning of the great age of pilgrimages and there are a number of guidebooks to the major shrines at Jerusalem, Rome and Compostela. There are also accounts made by pilgrims who returned and miracle stories detailing how the saints helped them do so. The best of these guides is contained in the Codex Callistinus and was written by a clerical pilgrim named Aymeric Picaud at almost the same time my characters were on the road. Picaud gave all sorts of advice on what to wear, what to bring, and most importantly, whom to trust. The answer was “no one.” Picaud warns against rapacious innkeepers, bandits and shifty fellow pilgrims. This on top of bad weather, wolves and foreign diseases! The account might have deterred a few pilgrims from making the trip but it also encouraged them with a loving description of the town of Compostela and the shrine of St. James the Greater, the goal of the trip. There were those who might have even felt the dangers of the journey to be an added incentive, for they could offer their suffering to God. The stories contained in these accounts are a gold mine for a writer. Having people die on a pilgrimage was not difficult. People did all the time. This was not only from the rigors of the trip, but the condition of the pilgrims when they started. Many were going to the shrine to ask for a miracle of healing or, as my Catherine and Edgar were, to beg for a healthy child. Other people went on pilgrimage at the end of their lives, to prepare themselves for the next world and, perhaps, to have one last adventure. Therefore, the problem was the make death suspicious enough for someone to feel the need to investigate it. I had to wait until the third death in my party of pilgrims before it occurred to anyone that there was a murderer at work. And even then, the murder had to be particularly obvious. After much consultation with other medievalists, I spitted the body with a spear and draped it in a church over a sawhorse. Hard to miss, don’t you think? And not likely to be accident or suicide. The other problem about death on the road is keeping the suspects from slipping away. Since Christie, among others, had her people snowbound, I felt I couldn’t go that way. Therefore, I finally decided that the goal of the pilgrimage would be more important to most of the travelers than the fear of being killed. Since in many ways a pilgrimage is a metaphor for life, and was commonly used as such in medieval sermons, the fear of death was only one of many faced by the pilgrim. And, as they all knew, the death of the body is nothing to the death of the soul. Also, it was always advisable to travel in a large, well-armed group. One could wait weeks before another party came by. Therefore, my pilgrims decided to forge on. Of course religious fervor was not the only reason for taking a pilgrimage or I might have been stuck with a very boring group of saints. Curiosity, wanderlust, the need to get away from bad debts or a bad marriage motivated many to take to the road with staff and water flask. Some petty criminals were given the option of going on a pilgrimage just to get them out of town. One miracle story involves a priest who went on a pilgrimage as a ruse for running away with a married lady of the parish. In the story they were miraculously caught. In real life, one wonders how many people used the trip as a cover for starting over again. A journey of any sort is a great change of pace for a writer, as well, especially when one is doing a series. One can introduce new characters and put the old ones in new situations. The characters have to go through foreign lands with different languages and customs. The opportunities for conflict are endless. There was one other reason for me to write a book set on the road to Compostela. I wanted to go, myself. I followed the same route that Catherine and Edgar took in the book and there are many parts of it that haven’t changed much in eight hundred years. The pilgrim trail sometime parallels the autoroute and sometimes weaves through mountain passes still heavily forested. The path, itself, has worn down in places far below the surrounding land, scuffed and marked by the feet, sometimes bare, of the pilgrims. That is the most amazing thing about the route to Compostela and one reason I’m glad I decided to use it for one of my medieval mysteries. The history of the pilgrimage hasn’t ended. Thousands of people still walk or bicycle the entire route and their motives are as varied as those of the medieval pilgrim. Since Strong as Death came out, I’ve had several letters from people who have either taken the pilgrims’ route or are planning on doing so. I heartily recommend it, even if you go by bus or car instead of on foot. Send me a postcard from Conques or Moissac or Najera. But if you find any bodies on the way, you’ll have to investigate on your own. One murderous journey is all I care to take.